Gloria always had a dream that her grandson would buy a Harley when he grew up. Then he could take her on rides. It never happened so he, his wife and child organised the birthday Harley Davidson ride for her. They live on the Central Coast so drove down to Sydney and met Jungle at Circular Quay. 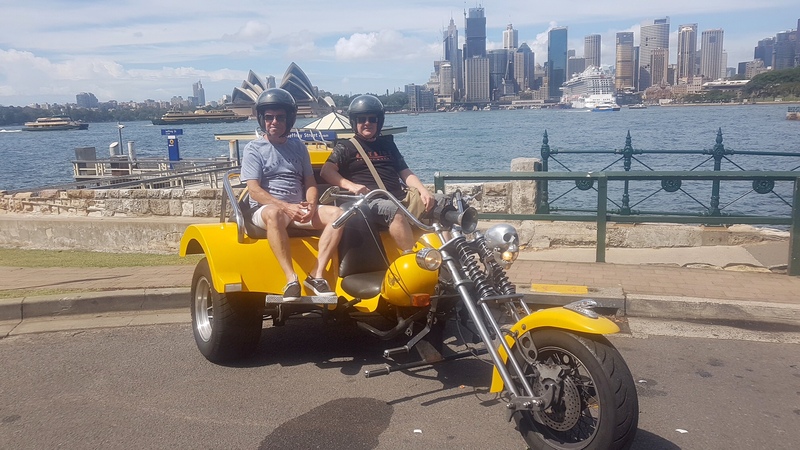 They rode over the Sydney Harbour Bridge and stopped for photos at Kirribilli. There are wonderful views across the Harbour to the Opera House and the city. They continued on to do the 3 Bridges tour. 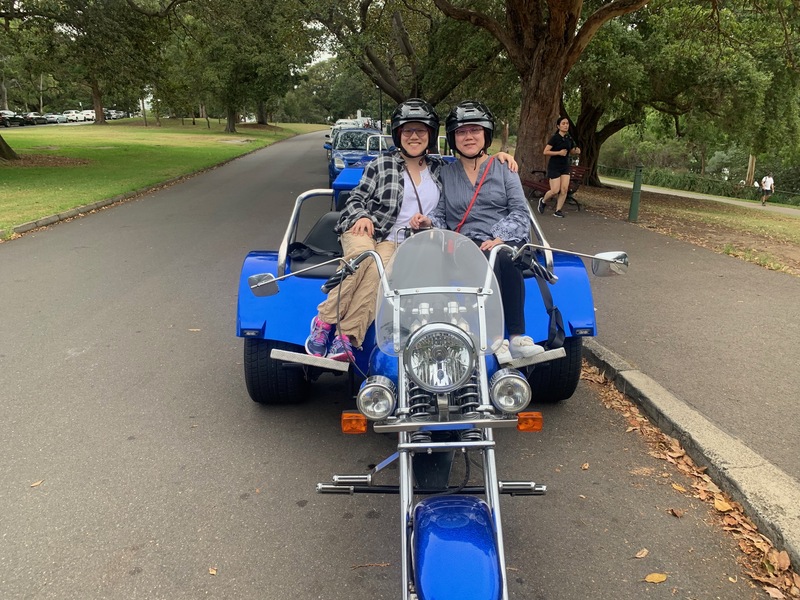 This meant they rode through the lower north shore suburbs to the inner west. Over the interesting Gladesville Bridge and along Victoria Road, a main arterial road. Soon they turned off Victoria Road to follow the Bay Run. People come from all over Sydney to walk or run the 7 kms of the Bay Run. It is part of the inner western suburbs and really is a pretty area. The Bay Run travels around the Iron Cove Bay, part of the Parramatta River. Then they rode over the incredible ANZAC Bridge, through the city and back to Circular Quay. 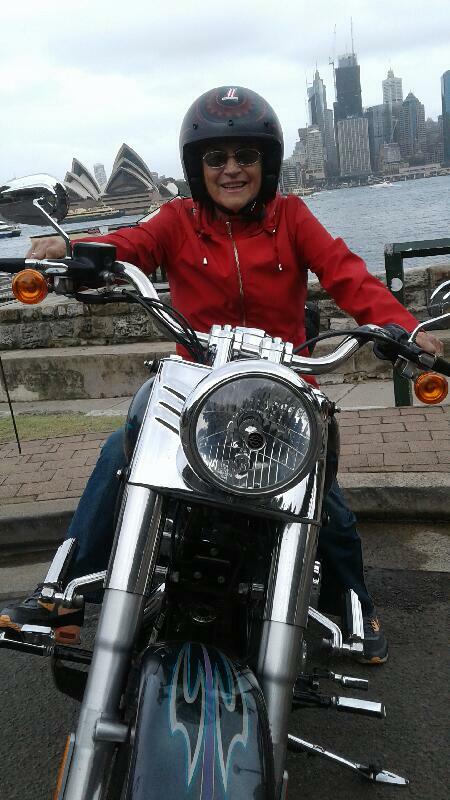 Gloria loved the roar of the Fatboy Harley and she had such a fabulous experience. A birthday Harley Davidson ride is always one of the best presents you can get someone. Contact us and we will happily help you organise the experience of a lifetime. The Bay Run is a 7-kilometre-long (4.3 mi) shared use path for cyclists and pedestrians that encircles much of Iron Cove and is located in the inner-western suburbs of Sydney. The Bay Run is particularly popular with joggers, walkers, roller skaters and cyclists who enjoy the pleasant waterside scenery whilst participating in exercise. The shared path passes through the suburbs of Rozelle, Lilyfield, Haberfield, Five Dock and Drummoyne.